We’d love your help. Let us know what’s wrong with this preview of Pathfinder Tales by Howard Andrew Jones. The race is on to free Lord Stelan from the grip of a wasting curse, and only Elyana, his old elven adventuring companion and former lover, has the wisdom and reflexes to save him. When the villain turns out to be another of their former companions, Elyana and a band of ragtag adventurers must set out on a perilous race across the revolution-wracked nation of Galt and the treacherous Five Kings Mountains, bound for the mysterious Vale of Shadows. But even if they can succeed in locating the key to Stelan's salvation in a lost valley of weird magic and nightmare beasts, the danger isn't over. For Elyana's companions may not all be what they seem. Howard Andrew Jones is normally a pretty solid writer, but he's pretty clearly just phoning it in here. This was a very good entry into the pulp sword-and-sorcery quest genre. The characters' motivations are both unusually believable and unsually complex (non-contiguous, and sometimes mutually incompatible, qualities). The world-building (dependent here on the Pathfinder RPG property) is serviceable. The pacing bogs only very occasionally, and the action sequences are handled with just the right degree of detail, evocative and clear without belaboring each sword swing or blood spatter. The two real This was a very good entry into the pulp sword-and-sorcery quest genre. The characters' motivations are both unusually believable and unsually complex (non-contiguous, and sometimes mutually incompatible, qualities). The world-building (dependent here on the Pathfinder RPG property) is serviceable. The pacing bogs only very occasionally, and the action sequences are handled with just the right degree of detail, evocative and clear without belaboring each sword swing or blood spatter. The two real standout elements here are the interlude structure and the complex love triangle which binds the three primary characters. This is the tale of a retired adventuress, her retired ex-sweetheart, and the apparently not-so-retired traveling companion who used to be a part of their merry dungeon-delving band. There's a quest narrative here (the search for a mysterious artifact to cure a curse), but it could have bogged down or turned into an episodic ODTAA parody of the genre. It doesn't because the clever device of having our protagonist be a retiree means she (a) gets to spend plenty of the text reflecting on the past in a thoughtful manner and (b) breaking up such musings with dramatic action scenes which pop in as flashbacks between major chunks of the main book. As a pacing device, that's pretty clever. The love triangle, not to get too spoilery about it, is central here, forming not only the basis for our protagonist's quest, but for the curse which sets it in motion. The 'villain' of the piece is one of the legs of this triangle, and his character development is handled particularly well. Of special note is a brief discourse on the nature of love between our protagonist and our villain, and it's pretty serious fare for a tossaway paperback like this one. It elevates the material, and possibly the genre as a whole. I really enjoyed this novel. It had good action and plot twists that fit in well with the story, but I didn't see coming (which is quite rare). The main character is likable, but not compelling. However, there are a couple of outstanding supporting characters. Jones once again proves he is a master of the sword-and-sorcery genre. There are twists and turns aplenty, but the plot is secondary to the Howardesque action. A most entertaining read. Have you ever been pulled into a world with the force of being pulled into a black hole? I was totally engrossed in the first 50 pages or so of Plague of Shadows. What wasn’t there to like? It introduces a wise, strong, mysterious female elf protagonist training a young, intelligent, and brave young noble while trying to solve a mysterious curse in the midst of not one, but two, different love triangles. Much of the action takes place in an extremely well-conceived, vividly portrayed vision of t Have you ever been pulled into a world with the force of being pulled into a black hole? I was totally engrossed in the first 50 pages or so of Plague of Shadows. What wasn’t there to like? It introduces a wise, strong, mysterious female elf protagonist training a young, intelligent, and brave young noble while trying to solve a mysterious curse in the midst of not one, but two, different love triangles. Much of the action takes place in an extremely well-conceived, vividly portrayed vision of the Plane of Shadows. Who would have thought that something that sounds so dark and dim could be so innovative and fascinating? And, while this will be a negative to some readers, I even felt that there were spots where I could hear the dice rolling in the background. Yes, I know that some editors of game fiction want to guarantee that you can’t directly connect the combat in their related novels to the action in the fiction. I want to perceive how something in the novel could or might work in the game. I really liked the fact that I could visualize a game situation as well as a “life” situation during several of the battle scenes. That wasn’t what dispelled my enjoyment of the novel. I don’t even know if I can explain what I hated about the latter portion of this novel without providing a spoiler. Let me simply say that there are times in fiction (whether in short stories, novels, or on stage or screen) when one wants to completely transform the readers’/viewers’ perspective of certain characters within the course of a story. Most commonly, this is where our idea of the villain or presumed villain changes for the better and sometimes, it is where our idea of the protagonist or one of her/his allies changes for the worse. From the beginning of Plague of Shadows, one senses that one or the other of these transformations is likely to occur. Now, such transformations can be fairly interesting, but I hate them when there is inadequate foreshadowing or foundation-building for the transformation. I like it when the protagonist has missed a vital clue or has a significant misunderstanding of something that has happened in the past to cause the transformation(s). Oh, there are misunderstandings in the background relationships of Plague of Shadows, but the transformation(s) are (were) sudden and basically inexplicable—even during the dénouement section. I don’t mean to say that the conclusion is completely unsatisfying. In spite of “liking” the heroes who survived, I found myself frustrated by the fact that the characters I found most interesting don’t appear to be set up for the sequel and those which are set up for the sequel don’t really make sense as adventuring companions in the long run. In short, Plague of Shadows started out at my diamond level and ended as cubic zirconia. Plague of Shadows, in the end, is genre fiction at the median level. The references to the world come across as forced, as though author Jones had imported an existent story into a company's setting. He also does a less than admirable job of making the reader feel any sense of distance, which makes the journeys seem somehow less important than the brief spasms of conflict. Jones also has one of the worst in-book references to a game mechanic I have ever read where he has a bard actually say, as Plague of Shadows, in the end, is genre fiction at the median level. The references to the world come across as forced, as though author Jones had imported an existent story into a company's setting. He also does a less than admirable job of making the reader feel any sense of distance, which makes the journeys seem somehow less important than the brief spasms of conflict. Jones also has one of the worst in-book references to a game mechanic I have ever read where he has a bard actually say, as he plucks his musical instrument, "How about a little inspiration". I burst out laughing, and had it happened in the first third of the book, that might have been enough to make me put it down and never return to it. As it was, the story was near its climax and Jones had built up enough good will for me to forgive such an awkward placement. Good adventuring with a nice angle, as someone else noted, "what happens when elves get too old for this s*&^?" A blend of D&D adventuring with tones of Jirel of Jory and the western, Unforgiven. The payoffs here are setup through characters, hard truths and exposed lies. I look forward to Jones next entry in the Pathfinder universe, and I need to check out some of the other authors and novels of this world. This is the ?third? book in the pathfinder series. I'm a bit meh on this one. I enjoyed reading it, but, wasn't really that into it. I did very much enjoy the ending, as it left something open for a continuation if desired but was otherwise a nice wrap-up to the story. At first this book just seemed like a Pathfinder adventure translated to novel form. However, as the story progressed, the characters, especially Elyana, became more detailed and more interesting. The plot twists were fun and engaging so that in the end, I thoroughly enjoyed the book. Good if you're looking for a straightforward quest-type fantasy, though not much really stands out. Another great beach read, quick but thoroughly enjoyable! Very quickly, I had a hard time getting started in this book but I'm so glad I stuck with it. The female lead was a little hard for me to relate to but once I got to know her a bit better, I was impressed. The hero snagged me from the start with his interesting profession and abilities. The unexpected ending made me enjoy the book even more. I'd recommend it to anyone who loves a good fantasy novel. The story is set in the world of the Pathfinder Roleplaying game. When you have played this game, or any past iteration of it, for as long as I have and you pick up a book based on the world inspired by the game, you know that the setting in which the story evolves will be familiar to you. You also know that no matter how good an author is, the similarities with the games will most likely stop there. You may recognize some character classes and assuredly, character races, maybe even a few abilit The story is set in the world of the Pathfinder Roleplaying game. When you have played this game, or any past iteration of it, for as long as I have and you pick up a book based on the world inspired by the game, you know that the setting in which the story evolves will be familiar to you. You also know that no matter how good an author is, the similarities with the games will most likely stop there. You may recognize some character classes and assuredly, character races, maybe even a few abilities or magic effects, but that is where the ressemblance ends. Well, not in this book! I was amazed to discover that the story had the same feel as watching a game unfolds. Of course, it is a story, so the mechanics of the game is not apparent and the drama is there, but even so, the way the story is written and the battles described, you feel as if a game was being played in front of you. Even if you do not play or know the game, it is a very well written story. The characters are varied and intesresting; the battles are packed with action and surprising turn of events; and more importantly, it is unpredictable. Oftentimes, in such shorter books, you can identify the villain and almost anticipate the ending, but not here, at least, not until a few dozens of pages before the end. The pace of the story goes from moderate to fast and it does not relent. Contrary to other stories based on the game, or on any other games for that matter, it is well crafted and does not contain any dull moment. Even the interaction between the characters is interesting and the secondary characters feel full-fledged. I am used to reading stories that are written over several books, so I was delightfully surprised and extremely impressed to read one that did not feel rushed and that kept me entertained from the firts page to the last page. The series of Pathfinder Tales books are a mixed bag so far. They're fast food. They offer a deeper look at the various countries of the Inner Sea region of Golarion, clad in fantasy tales. Now, let's say that this is McDonald's fast food. My favorite burger there is the Big Mac. Dave Gross' Prince of Wolves set in Ustalav was a Big Mac. Elaine Cunningham's Witch of Winter was a cheeseburger. Tasty, but not filling, and lacking substance. Plague of Shadows is a hamburger. Not as tasty as the che The series of Pathfinder Tales books are a mixed bag so far. They're fast food. They offer a deeper look at the various countries of the Inner Sea region of Golarion, clad in fantasy tales. Now, let's say that this is McDonald's fast food. My favorite burger there is the Big Mac. Dave Gross' Prince of Wolves set in Ustalav was a Big Mac. Elaine Cunningham's Witch of Winter was a cheeseburger. Tasty, but not filling, and lacking substance. Plague of Shadows is a hamburger. Not as tasty as the cheeseburger, and kinda bland, but you eat it anyhow. It didn't really do anything that I want from a Pathfinder Tale. I want a deeper look and feel for the atmosphere of its Golarion region. This story begins in Taldor, moves through Galt and touches on Kyonin, but none of them in any depth. Galt is pretty much the French Revolution going on perpetually, and it would have been fun to find out more about the power structures and factions. Hell, you don't even get any motivation for the BBEG at the end. I have no idea what this guillotine event is all about. Galt=evil, without any true explanation. Disappointing. Kyonin is similarly skimmed. The only thing I really liked was Elyana as a character, though again, she lacked any real depth. It would have been more interesting to see her develop more with Drelm, the half-orc. The writing was excellent, and the plot twists actually surprised me. The only faults I found with the novel had nothing to do with the writing, but are faults with the genre - largely, I don't like healing magic. I think it takes away from the peril. Imagine if John McClain had access to healing potions in the Die Hard movies. (This is also why I don't allow clerics in my personal DnD or Pathfinder games). However, I thought Howard Jones did a superb job within the constraints of a genre that is The writing was excellent, and the plot twists actually surprised me. The only faults I found with the novel had nothing to do with the writing, but are faults with the genre - largely, I don't like healing magic. I think it takes away from the peril. Imagine if John McClain had access to healing potions in the Die Hard movies. (This is also why I don't allow clerics in my personal DnD or Pathfinder games). However, I thought Howard Jones did a superb job within the constraints of a genre that is not always conducive to effective story-telling. I much prefer his Dabir and Asim stories with their more subtle forms of magic, but again that is a genre preference and really not a criticism of the writing itself. This novel was MUCH better than most DnD-type world novels where uber-magic typically steals the thunder from characters (leaving them all too often mere archetypes), and that is a credit to Howard Jones' writing. His characters were interesting, and I liked how he wove the past into the present to show characters with conflicting motivations and desires. 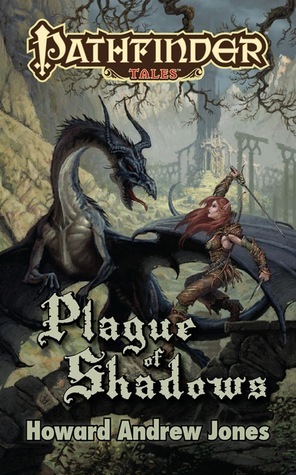 As a book whose plot takes place in the campaign setting of a popular roleplaying game (Pathfinder RPG), published under the imprint of the company responsible for the game (Paizo), it should come as no surprise that Plague of Shadows is not art, or even excellent entertainment. Like many such books, in a category of fiction I tend to call "professional fanfic", it stumbles at times over the clumsy limitations of compatibility with game rules that were clearly never well thought out in terms of As a book whose plot takes place in the campaign setting of a popular roleplaying game (Pathfinder RPG), published under the imprint of the company responsible for the game (Paizo), it should come as no surprise that Plague of Shadows is not art, or even excellent entertainment. Like many such books, in a category of fiction I tend to call "professional fanfic", it stumbles at times over the clumsy limitations of compatibility with game rules that were clearly never well thought out in terms of how they would affect prose. Despite its limitations, it is an engaging read, moved by a mostly well-crafted yarn, enriched by effective use of commonly powerful themes -- redemption, the bittersweet passions of star-crossed lovers, finding strength in misfortune, coming of age, and even an example of the ". . . and the adventure continues" style of ending, to name but a few such tropes that somehow never come across as trite or hackneyed. Plague of Shadows was one of the most entertaining Pathfinders Tales books to date, if not the best one. I can find few flaws other than some confusion regarding various character twists involved. However, as a gamer, one thing I loved about this is the mix of flashbacks. The leading protagonist shows us memories of a group of adventurers from when she was younger, mixed in with the current state of their dysfunction. 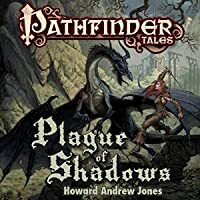 It gives a sense that the spirit of the storyline began years ago and is comin Plague of Shadows was one of the most entertaining Pathfinders Tales books to date, if not the best one. I can find few flaws other than some confusion regarding various character twists involved. However, as a gamer, one thing I loved about this is the mix of flashbacks. The leading protagonist shows us memories of a group of adventurers from when she was younger, mixed in with the current state of their dysfunction. It gives a sense that the spirit of the storyline began years ago and is coming to a conclusion long after the original party went separate ways. It also has the added twist of a long-lived character solving an old mystery with the help of a newer, younger group of adventurers. The book, as with others in the series, gives us wonderful insights into new parts of Golarion. We see firsthand more about elves, the shadow plane, and the cruel lawmen of Galt. I really breezed through this one. I liked how established the characters felt, like they had their own series of books set some time in the past, but without having to read those books. It is refreshing to me because it feels like sometimes the world doesn't really move until whoever-PoV-Character sets off on a journey. Sure, things can be in the works, but these characters had history, like references or in-jokes that pop up in groups of friends or co-workers. The setting for this one felt the I really breezed through this one. I liked how established the characters felt, like they had their own series of books set some time in the past, but without having to read those books. It is refreshing to me because it feels like sometimes the world doesn't really move until whoever-PoV-Character sets off on a journey. Sure, things can be in the works, but these characters had history, like references or in-jokes that pop up in groups of friends or co-workers. The setting for this one felt the most "standard" of the Pathfinder books so far, but I think the description of the shadow plane were really neat. Novels set in a published game setting and/or written to fit within the framework of a published game system have advantages and disadvantages compared with other novels of their genre. This novel is set in the world of Golarion, the official campaign setting for the Pathfinder RPG. As this is a game I play, and a campaign setting that I play in, there is perhaps a closer connection for me than for a reader not familiar with the setting. On the other hand, because it is a published game setting, Novels set in a published game setting and/or written to fit within the framework of a published game system have advantages and disadvantages compared with other novels of their genre. This novel is set in the world of Golarion, the official campaign setting for the Pathfinder RPG. As this is a game I play, and a campaign setting that I play in, there is perhaps a closer connection for me than for a reader not familiar with the setting. On the other hand, because it is a published game setting, the author does not have complete creative freedom. So, while the author is able to do what he likes with the characters he has created, we know that, on the whole, no earth-shaking or universe-changing events are going to take place. Did not expect to love this so much from the sort of stilted (in my view) start. A lot of odd stuff happens all at once, and some (apparent) stereotypes/definitions put onto the characters that didnt make them seem very interesting. Could not have been more wrong. Its all sort of a set-up so you can see how much they grow and change, so you understand how difficult some of the choices they have to make are, lending them a great deal of force and drama. I cant even begin to dissect the plot these Did not expect to love this so much from the sort of stilted (in my view) start. A lot of odd stuff happens all at once, and some (apparent) stereotypes/definitions put onto the characters that didnt make them seem very interesting. Could not have been more wrong. Its all sort of a set-up so you can see how much they grow and change, so you understand how difficult some of the choices they have to make are, lending them a great deal of force and drama. I cant even begin to dissect the plot these characters traverse other than to say its a thrill-ride, and like most of what I call good books, it escalates and speeds up the farther you get into the book, until you are completely sucked in. I think I saw this author has written several other works and I am going to hunt them down immediately. Solid four stars for Howard Andrew Jones on this rollicking high-fantasy story! Aside from a few characterization issues that are probably simple personal preferences on my part, no real flaw in the story, I truly enjoyed this fantasy "Quest Perilous" romp. Based in Paizo's world of Golarion, where the Pathfinder Tales novels all take place (it is a truly vast and rich environment, and one I have often played in myself) the story centers around a "rescue" plot with so many twists and turns that Solid four stars for Howard Andrew Jones on this rollicking high-fantasy story! Aside from a few characterization issues that are probably simple personal preferences on my part, no real flaw in the story, I truly enjoyed this fantasy "Quest Perilous" romp. Based in Paizo's world of Golarion, where the Pathfinder Tales novels all take place (it is a truly vast and rich environment, and one I have often played in myself) the story centers around a "rescue" plot with so many twists and turns that it leaves you breathless. The ending is a little too "happy" for me, but I'm a little bent that way... I like dark, sad endings that bring tears to your eyes, and this one was a little too sweet...though not too "good". Although I'm not very fond of books that are all over the place, Howard presents a very decent story. As many pathfinder novels it made me feel like I was there with Elyana, Renar and Drelm. The introduction had a very messy start. It made me feel like I had to go back a few pages because it squeezed a lot of information. I liked how we were introduced to the main character. The middle chapters had a lot of info about Golarion. And that's when I got lost at first. Even though I know the geography Although I'm not very fond of books that are all over the place, Howard presents a very decent story. As many pathfinder novels it made me feel like I was there with Elyana, Renar and Drelm. The middle chapters had a lot of info about Golarion. And that's when I got lost at first. Even though I know the geography I felt it was a lot to take in. Kind of flat. Never felt that engaged with the characters nor the Pathfinder universe. I am comparing it to a couple of other Pathfinder books I have read, Pirate's Honor and Queen of Thorns. Both did a better job of getting you to know the characters and gave a better flavor of the Pathfinder universe. I will say that as an active player in the RPG Pathfinder system, that I did appreciate the accuracy of the fight scenes. A generation ago, the elf Elyana was part of a band of adventurers who fought the shadow wizards. Now, 20 years later, she sets out on a desperate journey to save one of her old friends from a curse, a journey fraught with danger and betrayal and shadow magic. I've read both of Howard Andrew Jones' Dabir & Asim books and quite enjoyed them. This was the first time I read something of his written in the third person, juggling a larger cast of characters and multiple viewpoints in a higher-magi A generation ago, the elf Elyana was part of a band of adventurers who fought the shadow wizards. Now, 20 years later, she sets out on a desperate journey to save one of her old friends from a curse, a journey fraught with danger and betrayal and shadow magic. This review has been hidden because it contains spoilers. To view it, click here. This is a typical fantasy story. Nothing stands out about it. If you like the Pathfinder RPG and its world, I do not think you will learn much from this book. There was no mention of the Pathfinder Society at all. It was more or less "let's get the band back together and go find this magical artifact to save our friend." Characters did die, though. The main character seemed like an arrogant elf even though I don't think she was supposed to be arrogant as she had never really lived among elves.